The Park VNY – propeller aircraft finally have a home at Van Nuys Airport. The Park VNY, in conjunction with VNY Prop and Los Angeles World Airports are happy to announce our first annual Van Nuys Airport Prop Park Fly In here at The Park VNY! 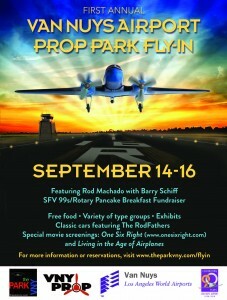 Join us for the weekend September 14-16 as we celebrate flight, our new prop park, and the Van Nuys Airport! For more information on volunteering, or just attending, visit www.vnyprop.org, or call the prop park at 818-902-2123! Transient Parking: Available-Please Reserve at least 24 hours prior to arrival. Located at the Northwest corner of Van Nuys Airport, The Park VNY can be accessed landside via Balboa Blvd or airside via Taxilane A2. Self-serve fueling services are open to the public 24/7. If you are coming to Southern California and need somewhere to park your aircraft overnight, use your trip as an opportunity to check out our new beautiful facility, The Park VNY. For transient info, email us direct at Transient@theparkvny.com. Please note* due to limited space, a reservation is required at least 24 hours prior to your arrival. The Park VNY is a Premier Aviation Community catering specifically to Propeller Aircraft Operators at the World’s busiest General Aviation Airport. Phases II and III of the facility are currently under construction, and the entire facility is being built on approximately 30 acres located at the northwest corner of the Van Nuys Airport. Once complete, it will provide Hangars, Tie-downs and Office Facilities for up to approximately 270 Propeller aircraft and related businesses. Learn more about the exciting plans for The Park VNY. Call us now to reserve your spot. Once complete, it will provide Hangars, Tie-downs and Office Facilities for up to approximately 270 Propeller aircraft and related businesses. In addition, we will feature approximately 115 newly constructed hangars ranging from 42′ x 35′ up to 100′ x 160′.